Gold declined Friday with other commodities and U.S. stocks, assuring its biggest weekly loss this year which came to $66.60, or 3.7%. 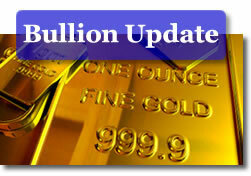 Many analysts had a bullish attitude toward the yellow metal when closing up shop last week. But sentiment — at least short term — quickly changed Wednesday when Fed Chairman Ben Bernanke testified before Congress without signaling another round of monetary easing. Gold plunged 4.3% on that day, recovered a modest 0.6% Thursday and then backed down 0.7% on Friday. On the final trading day this week, gold prices declined $12.40 to $1,709.80 an ounce in the April futures contract on the Comex in New York. The metal moved between an intraday low of $1,705.40 and a high of $1,725.40. Last week sizeable majorities polled in weekly Bloomberg and Kitco surveys had cast their expectation votes for higher gold prices. Opinions of participants have changed little in the latest round of surveys. "Bullish traders continue to dominate the Kitco News Gold Survey, as a majority of survey participants expect prices to rise next week," reports Kitco News. "In the Kitco News Gold Survey, out of 32 participants, 22 responded this week. Of those 22 participants, 14 see prices up, while 6 see prices down, and 2 are neutral… Those who see higher prices next week remain confident the trend for gold continues to be higher, despite the sharp break in values this week." Bloomberg gold survey results have 21 of 32 traders forecasting gains in gold next week. 8 are bearish and 3 neutral. Gold remains the third best performing precious metal this year, falling behind silver and platinum. Gold prices have advanced $143.00, or 9.1%, in 2012. One precious metal inched up this week. That was palladium with a pick-up of 0.3%. In the weekly losses, silver fell 2.3% and platinum shed 1.4%. On Friday, silver prices for May delivery sank $1.136, or 3.2%, to $34.525 an ounce, bracketing a low and high of $34.375 and $35.560. Rallying 23.7% (+$6.61) over last year, silver is the best performing precious metal. Platinum prices for April delivery lost $9.40, or 0.6%, to $1,691.70 an ounce, trading between $1,689.30 and $1,714.80. Platinum has gained 20.4% (+$286.80) in 2012. Palladium prices for June delivery fell $4.20, or 0.6%, to $712.55 an ounce, ranging from $710.00 to $723.00. The noble metal is 8.6% (+56.40) higher this year. Like bullion futures in New York, London metals declined in tandem since last Friday with weekly losses of 4.0% for gold, 1.0% for silver, 0.6% for platinum and 0.1% for palladium. Sales of U.S. Mint bullion coins were more active and consistent this week. In consistency, the Mint’s most popular silver coin, the Silver Eagle, advanced on each day of the week and its most popular gold coin, the one ounce Gold Eagle, moved up in four of the five days. In terms of activity, demand improved greatly for the same said Gold Eagle with sales up 13,000 on the week versus the poor showing of 1,000 last week. Weekly Silver Eagle sales were also a bit better, up 515,000 compared to the prior 415,000. For a recap on coin performances last month, read the CoinNews.net article on tumbling bullion coin sales in February. The following are the most recent daily, weekly, monthly and year-to-date bullion sales figures as published by the U.S. Mint. All bullion coin totals in the above tables are in the number of coins sold, not in the amount of ounces. The U.S. Mint rarely publishes daily sales figures for its five-ounce silver coins. These latest sales are as of Monday, February 27, 2012.